People who want a happier, less stressful lifestyle should consider getting a dog or cat. That is the conclusion of a study done by www.pethealthcare.co.uk. 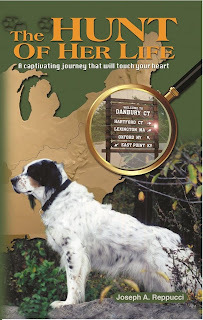 THE HUNT OF HER LIFE, a full-color book by newspaper journalist and MySetterSam.com publisher Joseph A. Reppucci, is must reading for animal lovers of all ages. It has 60 color photos of dogs to illustrate the compelling story of Samantha, an unwanted rescue dog adopted at age 2 by Mr. Reppucci. Travel with them along a trail of life filled with surprising twists, sudden turns, mystery and even what some call a miracle. And when the journey is finished, you may never look at people and their pets, motherhood - and perhaps even God - in the same way. THE HUNT OF HER LIFE will take you on a captivating journey - a trip like no other - that will touch your heart. 90 percent have a pet for companionship. 85 percent have a pet to get the endorphins flowing to make them feel happy. 48 percent have a pet for health benefits such as stress reduction. 44 percent have a pet for exercise benefits to get healthier and improve their lifestyle. 13 percent own a dog solely for protection or to guard their property. 93 percent are concerned about large veterinary bills. 92 percent worry about losing their loyal companion because of illness or old age. 84 percent are concerned about the cost of medicines. 82 percent worry about being adequately insured. 73 percent are concerned about their pet being stolen. 72 percent worry about their pet having a healthy diet. 67 percent are concerned about their pet maintaining a healthy coat. 54 percent worry about their pet getting adequate exercise. 53 percent are concerned about their pet being over or under weight. 46 percent worry about the quality of boarding kennels. The study found that kennels and catteries are falling victim to the hard economic times as only 18 percent of pet parents using them when they go away. Some 25 percent leave their pets with a relative and 27 percent with a friend or neighbor. Pet parents usually give the caretakers a gift or souvenir bought on their travels.